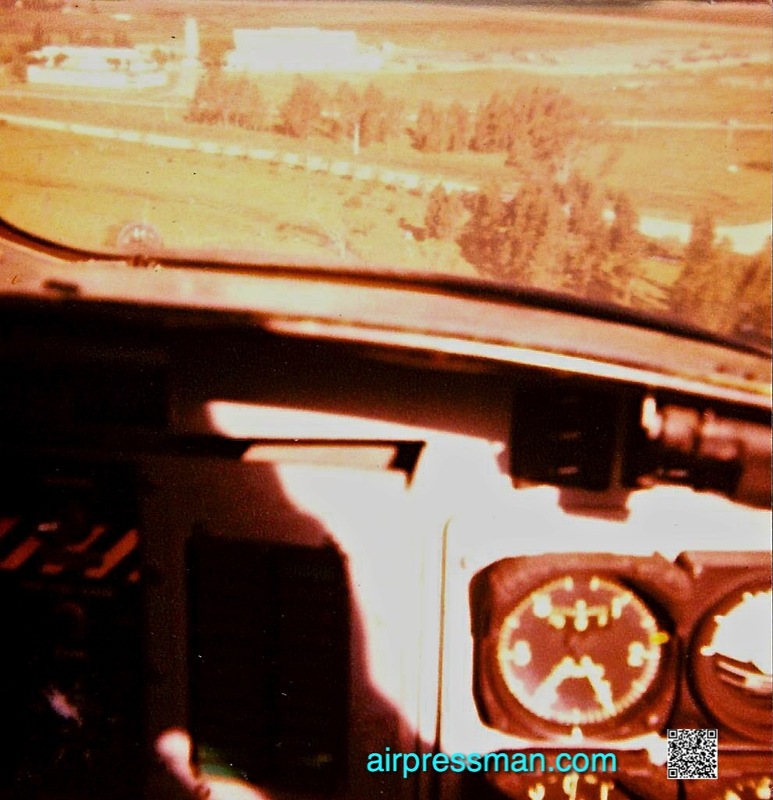 Flying alongside a test pilot, a young technician carries out a Functional Check Flight on Cessna A-37B “Dragonfly” . FAU 276, flown by Major (PAM) Schöpf de returns Durazno after a four aircraft bomb practice mission. 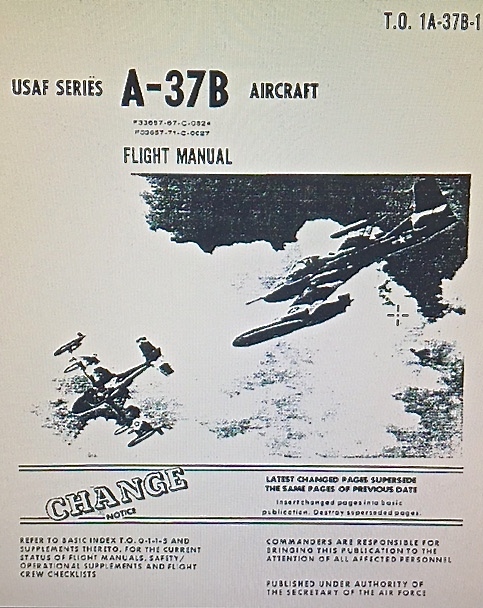 Aft on the formation were FAU 272 and 275. 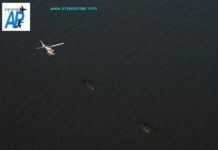 Picture taken by Airpressman from FAU 271. (Copyright Ernesto Blanco Calcagno/Airpressman.com)/Image preparation courtesy of de Pilotoviejo. Vicente reads all items in his laminated checklist diligently, firmly fastened to his right knee, with enviable celerity, worthy of a true professional. The aircraft’s side-by-side seating arrangement is useful for teamwork, allowing face-to-face communication, and to observe the pilot’s actions. With both helmet visors lowered (transparent and dark one), I set my oxygen mask tighter as reviewing in my mind the actions to take in case of a hazardous condition demanding an ejection from the jet: “Elbows IN, legs fully AFT, back straight, chin in, ejection lever UP,activate and press trigger”, and in accordance with the “Dash ONE” (a shortened name to the USAF Technical Order 1A-37B-1, or Pilot’s Flight Manual), in 0.21 of a second after squeezing a trigger on my seat, a catapult would propel me away from the jet. 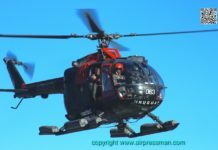 Previously, I would have to have the good fortune of the canopy having ejected before my seat, followed by the seat separation – in 1.5 seconds – from my body and parachute deployment. As part of his briefings whilst taxiing towards the runway, Vicente would always remind me: “I would give you the order to eject three times, if you do not eject, I shall leave you on your own”. That got my attention! As he completed the pre flight checks aloud, his voice obtained a stranger tone, ghostly like, as it mixed with the his breathing sound within the oxygen mask. “Brakes, power to 85%, engine instruments within limits”. The then short air refueling probe on the nose of the jet aligned with the runway centre line, indicated the path to follow. Full Military Power applied on both engines, then..brake release. The “monster” gets rolling on the warm tarmac. The cockpit’s air vents, force over us, that particularly peculiar set of aromas found on military types: a mixed of JP4 fuel vapors, rubber, teflon,aluminum, plexiglass, impregnating our nostrils and flight suits. Quick glance to the engine instruments indicates everything is in order and the take-off continues. “All green” I said over the intercom to assist Vicente during this busy time, indicating that all engine parameters were acceptable to continue with our sortie. 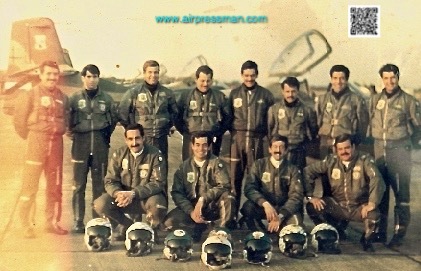 As “flying technicians” it was an unwritten rule that whilst flying we would assist our pilots keeping a close watch on the engine’s instruments, action particularly useful during formation flights as pilots keep their eyes, most of the time, on their formation leader. The aircraft is kept on the runway centerline with gentle inputs on the rudder pedals, at 60 knots the rudder becomes effective and at 100 knots we rotate into the ether. The “Alpha” elevates itself abruptly thundering into the sky, under the thrust of its two General Electric J-85-17A jet engines. As an Airman 1st. 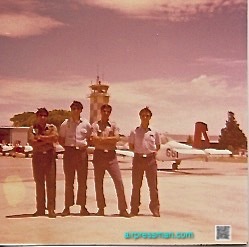 Class, maintaining these engines was my job, speciality obtained on graduation from the Escuela Técnica de Aeronautica – ETA (Aeronautical technical School) where the Air Force trains her technical non commissioned officers. Each J-85-17A generates a maximum thrust of 2850 pounds via its eight compressor stages and two turbine stages. The undercarriage is raised at 110 knots and up we go with 30 degrees nose up, leaving behind the most powerful base of the Uruguayan Air Force: Air Base No. 2 2nd. Lt. Mario Walter Parallada. 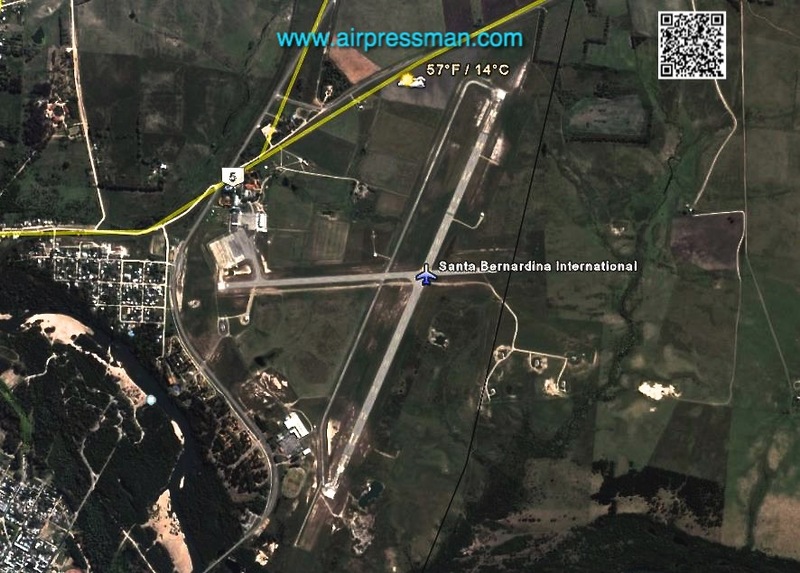 Strategically located in the outskirts of the city of Durazno close the the centre of the nation, and 188 km (100 miles) north of the capital Montevideo, the base is equidistant from all corners of the country, allowing the fighters to reach the nation’s borders in approximately 15 minutes. The fast ascend was needed as we were carrying out an engine Functional Check Flight (FCF in USAF parlance). A team of engineering colleagues and I, had completed a left engine change on the aircraft – FAU 272 – therefore it was standard procedure to accomplish a full in-flight engine check before returning to its full flying status. Being a test flight, If we needed to eject, it is a good idea to get as much clearance as possible between us and mother earth to increase chances of survival; furthermore the flight manuals states that the ejection seat escape system is designed to provide proper bail out during flight from 100 feet AGL (Above Ground) and from 120 knots to the aircraft maximum airspeed. The British built “Zero-Zero” type Martin Baker ejection seats, a luxury granted to our peers flying the FMA IA-58A Pucará, and not available in our sixties era machine the Dragonfly, a beefed up brother of the old USAF trainer, the Cessna T-37 “Tweety Bird”. “Good climb rate on this bird, uuh?” comments Vicente, as he gazed at the 4000 ft/min rate of climb, ascending on a spiral pattern over Durazno. Vicente informs Parallada Tower his intentions to climb above the base up to FL 210 (21.000 feet), and continues with his check list before the initiation of our tests: “Oxygen Mixer: NORMAL, Fuel: CHECK, Yaw Damper: ON, Engine Inlet Screens: AUTO, Parachute Zero Delay Lanyard:DISCONNECT, Altimeter: 29.92 HG. Whilst transiting through 10.000 feet on our climb to 21.000, Vicente advises me: “We remove our hook”. 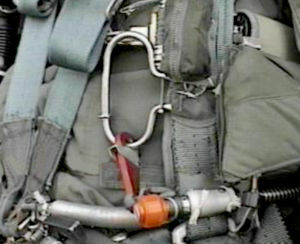 The “hook” known as “Zero Delay Lanyard Hook” was part of our dorsal parachutes and attached before take off to the parachute ripcord handle. In case of bailing out of the aircraft, the system would activate the parachute opening sequence immediately. The thing is, above 10.000 feet the rationale was that immediate parachute opening is undesirable as the ambient is too hostile (cold temperature, low pressure) thus the option was for either the crew member to manually activate the parachute or the aneroid device (barometric sensor) to actuate it as you drop from the sky below 10.000 feet – handy if you were unconscious! An emergency oxygen bottle was also fitted to the parachute and connected directly to helmet mask, thus ensuring survival at high altitudes. In the back of my mind I did have the thought of a recurrent fault in our J-85 engines: Compressor stall! This undesirable occurrence could be detected by hearing a loud bang, followed by an abrupt loss of thrust, engine RPM and increase of the EGT (Escape Gas Temperature). Having encountered the situation on previous test flights I remembered that jet engines stall for reasons as diverse as dirty compressor, hot exhaust gases ingestion into the compressor – usually on close formation flights – abrupt, high G maneuvers and foreign object damage (FOD). To minimize their occurrence, as part of regular maintenance engines were often cleaned with a mix of water and a product by the name of “Rust Lick”. This concoction was sprayed into the axial engine compressor from a pressurized bottle, whilst the General Electric was run for about 30 seconds under the torque of the engine’s starter-generator; it was now the time to check the recently changed engine in flight for proper functioning. My duties onboard was to assist Lt. Vicente inflight, observe and register the engine parameters during all phases of the flight. Leveling off at FL 210, the gracious female voice from ATC returns my attention to the cockpit: “Air Force 272, state type of aircraft?”. It was Montevideo Control, from Carrasco international airport, based about 100 nm south of our location, who would provide separation services from all commercial traffic.The VOR (DUR) located in our Air Base it is part of a busy airway connecting flights from southern Brazil to Buenos Aires, the Argentine capital. 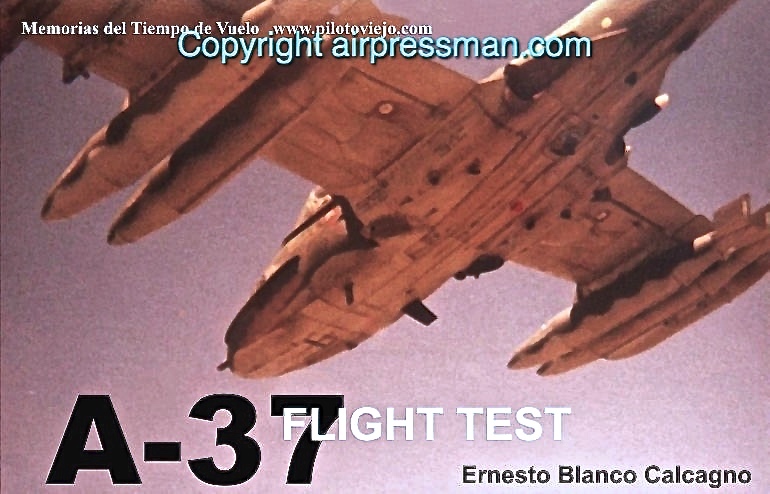 sensation.The lack of thrust on the left engine, creates asymmetrical thrust, so Vicente corrects the unwanted yaw with his left boot applying pressure on the left rudder pedal; whilst checking all indications that the “monster” was truly sleeping. However, due to the aircraft speed and wind effect (RAM effect) over the engine’s compressor, the engine continues windmilling – which is normal – at about 11% of the maximum revolutions per minute (RPM). As Vicente trims laterally and longitudinally on his “coolie hat” trim control switch above the control grip, we observe the RPM above 6% required by the manufacturer for an airstart. Vicente lifts the red guard and activates the “Emergency Ignition” switch. A loud “crack, crack, crack” noise indicates that the ignitors are ON and the corresponding warning light “L IGN”illuminates.This ignitors are a kind of high tension spark plugs fitted within the anular combustion chamber of the engine, thus providing the spark to start the engine. Left throttle is advanced forward to the START then IDLE position. The J-85 Fuel Control Unit (FCU) sends the JP-4 through the injectors and as they atomize the fuel inside the combustion chamber, Vicente’s starts the timer to control start up time. We both attentively look at the EGT indicator as to give us the first indication of a successful inflight engine start. As we get ignition, the engine’s murmur turns into a loud growl in crescendo…. “Mmmmmmmmmmmmmmmmm”. The General Electric is awake once more and the EGT gets near the 900 degrees Centigrade, the maximum allowed for this situation. Initial checks completed we proceed to the most exciting part of the test: High speed descend. With full power on both engines we would dive from an altitude of 21.000 to 9.000 feet, seeking to obtain a speed close to 415 knots – the limiting structural airspeed – of Mach 0.70 whichever occur first. 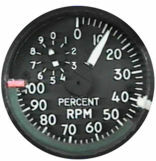 These high speeds place the aircraft on a phase of flight prone to engine stalls; as the air dynamic pressure would increase considerably during the dive. To regulate the inlet air flow the J-85 was designed with moveable inlet guide vanes or IGVs. These fixed “blades” – fitted on the air inlet of the engine – pan out from the central spinner cone, have hinged moveable vanes fitted, regulating the admission of air to compressor demands. Inlet guide vanes (IGVs) on a very dirty compressor! As the FCU senses engine fuel demands, the IGVs move based on this data; compressor bleed-air-valves fitted on both side of the J-85 also assist in regulating air flow, in proportion to the compressor needs. These devices, specially the FCU added complexity to the engine’s maintenance, and if improperly carried out, increased the probabilities of engine compressor stalls inflight. Both throttle levers are advanced to maximum “military” power, “RPM 100%, EGT, fuel flow, airspeed increasing and everything within limits”; it is time to dive: “Hold on, Blanco!” says Vicente before initiating an abrupt break. The Dragonfly descends dizzily; my eyes fixated on the central engine instrument panel. The high sun behind the jet produces flashes over the instruments glass covers, hindering my view. The creeks and the eucaliptus mounts under the aircraft’s nose increase in size due to the Stuka style dive close to 400 knots and the “Barber Pole” approaches the aircraft limit Mach number! The Master Caution light and annunciator panels remain off, that’s good news. Suddenly, a fleeting look reveals Vicente retracting both throttle levers to the IDLE position. The roar of the engines diminishes intensity, the analogue engine indicators, spin in a never ending dance; and the aircraft slows down, Vicente’s left hand thumb activates the micro switch situated on the left throttle lever and suddenly….it feels as if we are on an earthquake! Brrrrrrrrrrrreeeeeeeeerrrr, the ventral speed brake has been deployed creating a huge amount of drag and braking action consequently slowing down the jet, before pulling up climbing out of the dive. The speed brake – located on the belly just behind the nose wheel bay – acts simultaneously with the engine thrust attenuators (metallic moveable flaps fitted aft of the engine exhaust pipes). As they deploy into the exhaust gases they decrease thrust whilst – if required – maintaining higher engine RPM. With two hands on the control stick grip, Vicente applies considerable back pressure and with heavy buffeting and a “hunting” motion of the nose, the Alpha pulls out of the dive. On the climb, Newton’s inertia plays its roll, being reticent of not continuing our trajectory towards the ground, and my oxygen mask wants to drop away from my cheeks. I sense and feel the increasing positive G force all over my body, but worst, my peripheral vision starts to diminish and start to get “tunnel vision” as we go through 4 positive Gs. 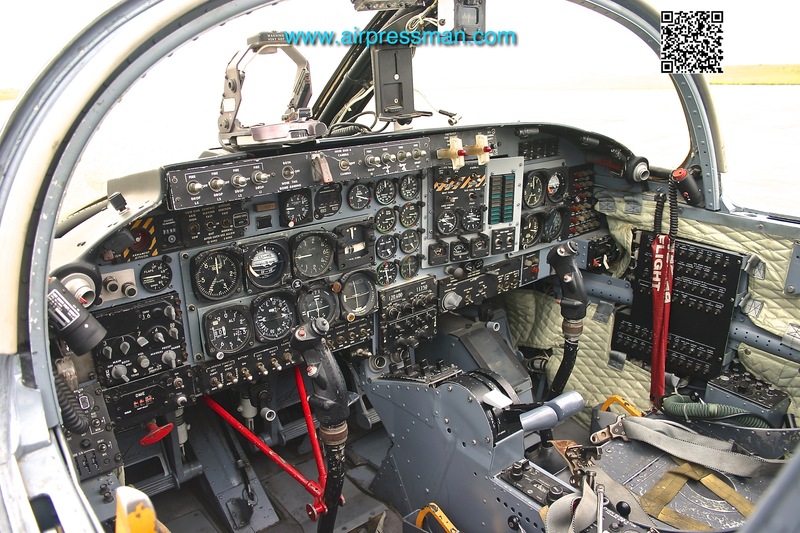 Without a G suit, as utilized in the older Lockheed T-33 -simply referred as “Tango” – the blood seeks the extremities of my body, decreasing brain blood irrigation and the consequent peripheral vision. 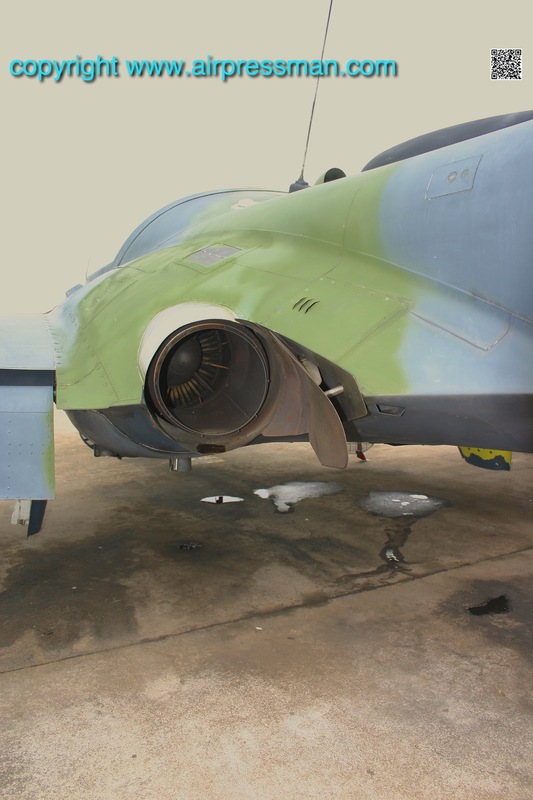 The J-85 thrust attenuators, seen retracted on a FAU A-37B on the ground at Durazno. Vicente agrees and lines up the Dragonfly nose towards the semi circular roofs of our base hangars. 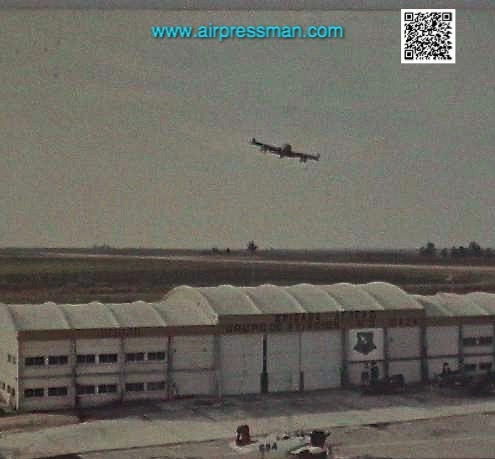 The brand new facilities of the then Fighter Group, our first target, followed by a bit further south the Grupo 1 hangar and the control tower immediately to its right. 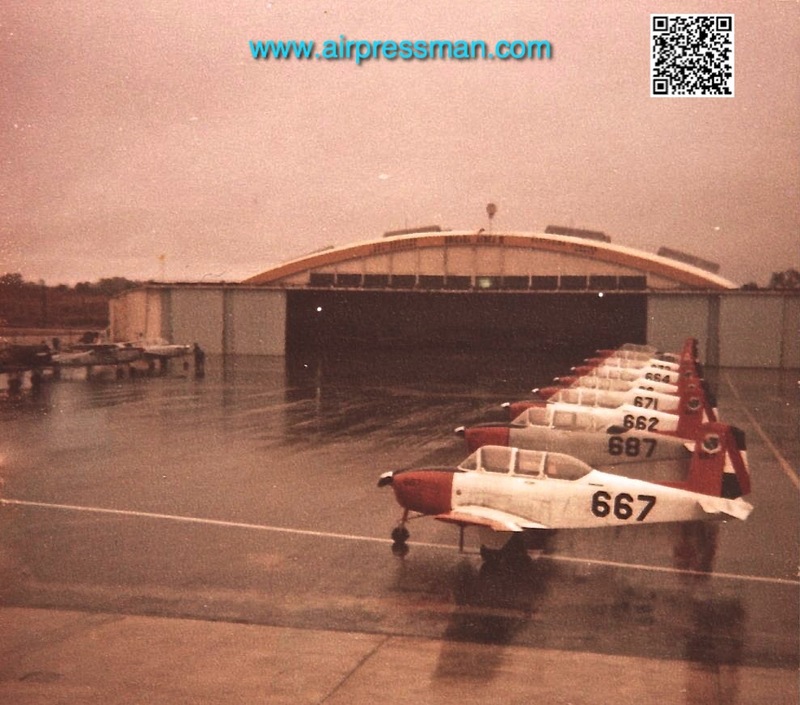 A beautiful line up of side by side Beechcraft T-34A/B Mentor graces the tarmac, as an old and tired North American T-6G Texan starts up his radial engine with prominent smoke plumbing over his worn out camouflage. The Dragonfly gains terrain and closes into her pray, unannounced, silently. “300 knots and 300 feet over the terrain” I thought; “what the hell, here we go!”. As you hear the roar of the J-85 engines above your head, it would be too late: the Mk-82 500 lb (227 kg) bomb with the “Snakeye” tail retarding device would be seconds away from impact.The A-37B would be on an high rate of turn, high G, low level, evasive escape maneuver, just about the tree tops as the then widely utilized “Southeast Asia” camouflaged paint scheme blends into of the Uruguayan countryside and its small fuselage provides a small target to the enemy AAA fire. Whooooooooooooooooosssssssssshhhhhhhhhhh….right over the hangar roof, my gloved hand placed over the black instruments fascia, wanted to reach and touch the hangar. The ATC tower swiftly passes over the right corner of my eye, the right hand wing tip tank with most of its 90 US gallons used up, does not allow visual contact with the ATC chaps – would kill to see the controller’s face, I thought! 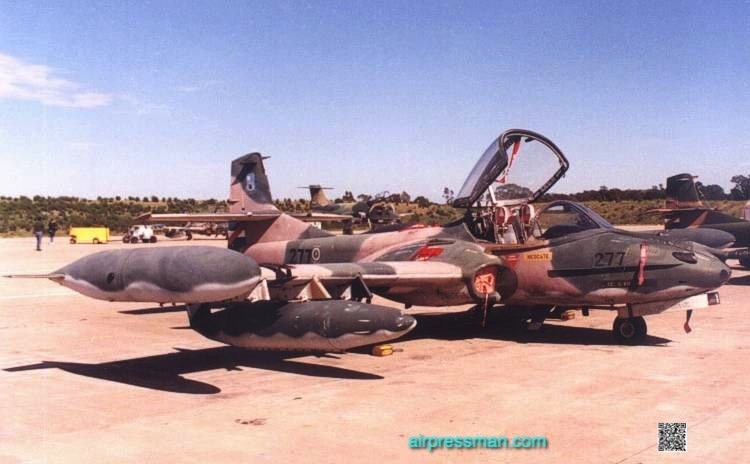 Next, comes our squadron’s tarmac with several parked venerable T-33s, and without warning Vicente pulls hard back on the stick, climbing nearly vertically, exchanging speed for height, on a zoom maneuver. Two vertical rolls follow, then inverted, attitude indicator spinning wildly, head and helmet swiftly aft into the seat back, dust and dirt floating in the cockpit the knees get close to my chest as the world outside is literally, upside down! Tututututututututu we hear next, as Vicente throttles both engines back to IDLE and the aural warning warns the crew that the engines are below 60% RPM and the undercarriage is not yet lowered. Run and break over the runway and we turn 180 degrees to the downwind leg and my pilots broadcast: “Parallada, Air Force 272, gear down and locked, flaps”. Landing light and air refuelling probe light ON! A touch of power to maintain 120 knots in the circuit, three of my technical colleagues on the ground, observe as their “baby” returns to her nest.Their faces light up and grins widen as FAU 272 turns final and the air refueling probe light in the nose is ON! 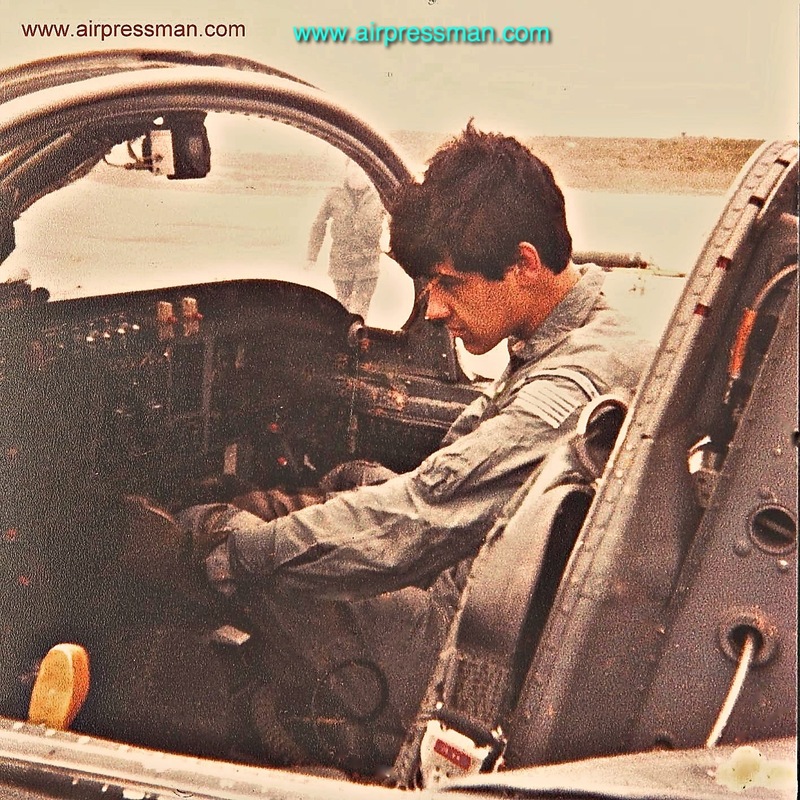 As we taxi in, the two yellow “paddle rackets” in the hands of the crew chief guide our aircraft to a well deserved rest, and Vicente shuts, sharply, both engines down. Yellow wooden chocks go under all wheels, fuel drains from the combustion chambers pour out JP-4, forming tiny puddles on the tarmac. Compressors still turning with speed down on both engines, their vanes reduce their tension – like a loose piano keyboard – its notes, noise, tempo gently decreasing. I leave my dorsal parachute over the ejection seat, place a boot over the retractable plate of the external foot support, hold on to the top of the windscreen and once again touch down on home, Oriental soil. The proud and possessive aircraft crew chief, approaches his beloved machine, like a father approaches his newly met daughter’s boyfriend. He has good reasons to care, his name is proudly displayed on a black rectangular sign adjacent to the jet’s nose. “Dumb” Acosta, a fellow graduate of the Aeronautic Technical School and as his nickname states, a man of few words mumbles: “How are you doing Blanquito?”. I looked at him as he busies himself inserting safety pins into the ejection seats and my smile says all that he needs to know about his cherished FAU 272. Vicente was walking away from the Dragonfly towards his office at the Operations area, anxious to sign off the aircraft’s maintenance logs. In his haste, realizing that he had not said good bye, he turned around and said: “Thank you for your hard work, Blanco” as he carries out a military salute. That simple gesture, combined with the satisfaction of having done a good job, signified at my young 19 years of age, pure happiness. Graduation day at the Aeronautical Technical School. December 18, 1979. The author is in the front row, third from the right. Dedicated to all my comrades from the past, present and future. Pilots and technicians that are amongst us or have flown higher. We have been and will always be volunteers to the tasks to serve the Homeland. The effort is intense, the road arduous and the reward meagre…but we would not miss it for the world! 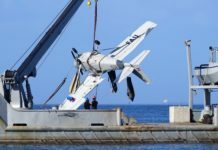 Uruguayan Air Force T-41D ditches in Punta del Este. 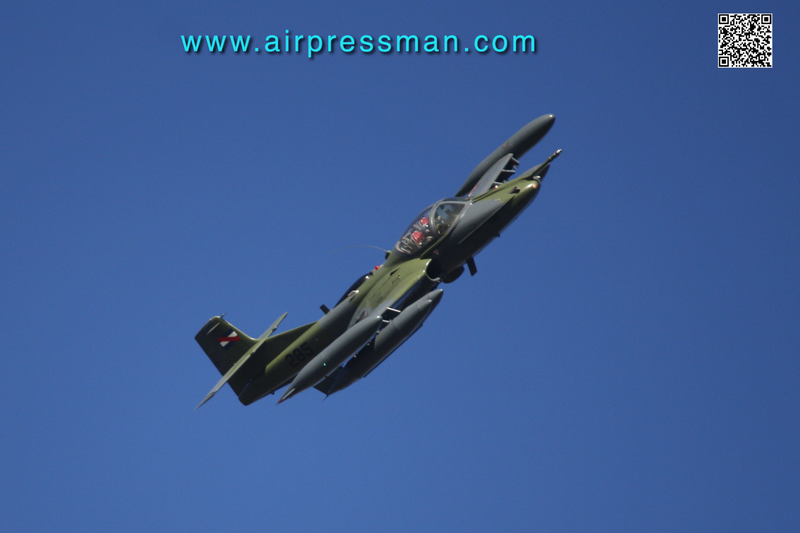 © Airpressman - All rights reserved.